The Samsung LABGEOIB10 features fully automated centrifugation inside the analyzer.In 20 minutes, users can obtain lab-quality results which help medical professionalsdiagnose and treat critically ill patients. No additional time required to test multiple analytes.The Samsung LABGEOIB10 can test up to three analytes in a single run. The Samsung LABGEOIB10 supports multiple tests. Users have the option of selecting a variety of parameter tests which best fit their clinical needs. The Samsung LABGEOIB10 is both compact and lightweight,providing unrivalled portability with its optional use as a battery-powered device.The Samsung LABGEOIB10 can be used quickly and easily in moving ambulances and during emergencies. Testing begins automatically when blood is injected into the disk and inserted in the unit.To perform a test, the user simply selects “New Analysis”, inserts a test reagent and then views the results. Despite its small size, the Samsung LABGEOIB10 is equippedwith a large 4.3-inch LCD touchscreen and an intuitive GUI withclear step by step instructions. Users can connect to Hospital Information Systems (HIS), PCs and mobile phones orother mobile devices for efficient database management.IT Solution can transfer results for reference, notification and database building. 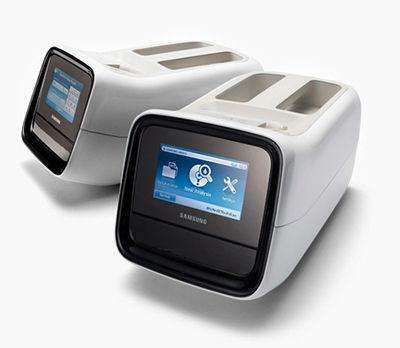 The Samsung LABGEOIB10 includes support for LAN connectivity,plus the use of multiple external devices, including USB Memory, Wi-Fi USBdongle and barcode scanner devices. RMS (Remote Management System) provides real-timeservice through equipment status checks and immediateresponse to errors from a service team.